A keen collector and sketcher of plant specimens from an early age, the author, educator and clergyman Charles Alexander Johns (1811�74) gained recognition for his popular books on British plants, trees, birds and countryside walks. Flowers of the Field (1851), one of several works originally published by the Society for Promoting Christian Knowledge, is also reissued in this series. First published by the Society between 1847 and 1849, this two-volume botanical guide for amateur enthusiasts focuses on the trees found in British woodland. Johns describes each species, noting also pests and diseases, uses for the wood, and associated myths and legends. The work is noteworthy for its meticulous engravings of leaves, seeds and blossom, and of the trees in natural settings. Volume 1 (1847), covering such species as oak, ash, beech and poplar, includes an introduction to the botanical terms used. 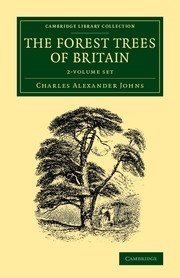 Volume 2 (1849) covers such species as chestnut, birch, elm, willow and cedar.